So, okay. 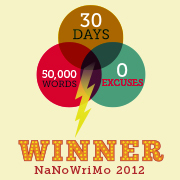 I did succeed at NaNoWriMo this year. I haven't mentioned anything about it since n'yeah because I'm still not done with the book yet, which is how it should be. I'm currently at 70,000 words, give or take, and steaming on to the big final battle. I'm going to keep writing through 2013, of course. I want to finish and then revise the NaNoNovel, and then I think I'm going to work on my short story game. I would like to submit a few complete stories this year, whether or not they get published. I had a very lovely Christmas holiday which consisted of visiting family and talking and generally being happy. I go back to work tomorrow, then I'm off again for New Year's Day, then I'm back to work for real. My resolution for the year at the office is to manage my timekeeping properly and to avoid any psychotic episodes. What else did I do this year? Oh that's right, I bought a house and moved into it, which still leaves me feeling bewildered every once in a while. I am proud to report that my home feels like home, and now that I'm settled in I don't think I'd trade it for any other house in the world, rickety fence and all. Next year will bring more surprises, and if they're as nice as this one has been I'll look forward to them. I paid attention to politics more than ever this year, and now my heart is full of hate. 'Nuff said. But I'm glad Obama won. And now because I wasn't really planning a recap of my year when I sat down I'll do some easy product shilling. I read some great books, I read some good books, I read some okay books. I don't think I've read any truly bad books this year, which is not a terrible thing. No Know Fear was a spectacular highlight for the generally fantastic Horus Heresy series, while Betrayer left me feeling completely frazzled (in a good way). Let's Pretend This Never Happened made me laugh, and I got some warm fuzzies rereading classics like Heir to the Empire and The Hobbit. I'm planning to read through The Silmarillion this year. All of it. I might write more about that later, but I suspect there's nothing more terrifying a man can do when he's trying to write his own epic (or any) fantasy book. I also might write more about Ravenwing, which was a very well-written book that still had me loathing most of the cast well before the halfway point. I have fallen in love with Two Best Friends Play!, and maintained my adoration for The Mike O'Meara Show and The Big O and Dukes. The one upside to an hour-long commute is that I can keep up with my favorite podcasts without too much trouble. I would also recommend Nerd Poker to anyone who wants to listen to a filthy Dungeons & Dragons podcast from professional comedian Brian Posehn. I've kept up with big changes in the comic book industry, but I'm sad to say that next year will probably see me cut back on my comics reading considerably, if I don't drop it entirely. I can't afford the price and the storage space to keep up with every Earth Shattering Event (tm) that comes down the pipe. With that said, I'm going to try to keep up with Saga and Transformers: Regeneration One, at the very least; and I'm very curious to see what Dan Slott has planned for the Superior Spider-Man. I still play video games when I can, though I rarely have enough time to get serious with them. I got my first Call of Duty game for Christmas, and I'm curious to see if my Battlefield skillz transfer over. And I'm bound and determined to get Sarah on board for a Lego Lord of the Rings playthrough. I'm not deeply committed to a lot of television shows. I'll be watching Doctor Who, and Game of Thrones, and the finale of Breaking Bad. I'll also try to keep up with The Walking Dead, which is more difficult than I'd like. For movies, I'm looking forward to the Evil Dead remake and trying to stay optimistic about World War Z. I'll take the rest as they come. There were a lot of good movies out this year, so suffice to say The Avengers was my favorite. Cheers man, good luck with your writing projects!